Alan Warwick’s garden secret. Will it be a Chelsea Sensation? Alan swore me to secrecy. He had raised a brand new weeping ornamental apple tree and that ‘in a few years’ it would be launched by Hilliers at Chelsea. This is the year! My readers already know eighty seven year old industrial chemist Alan Warwick! Former ICI boffin, he is my former student (a mature one) who when on the gardening course at Askham Bryan declared that in scientific terms the standard botanical explanation of how water gets to the top of a tall tree is complete nonsense! I don’t know if he is right but he offers his own explanation. I wrote about it last year. Every gardener knows that it is completely stupid to try to propagate an apple by sowing a pip. Not only will a new seedling take more than a decade to fruiting, the odds are phenomenal against it being worth eating. In this case flowering. 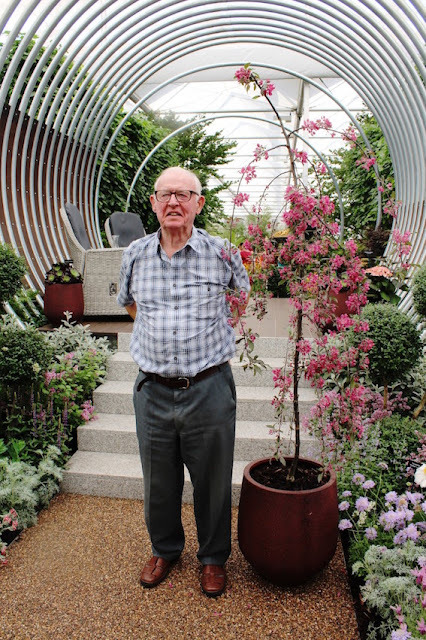 Alan knows this but his scientific curiosity got the better of him and fifteen years ago he collected a few pips from his ornamental apple tree and raised a dozen seedlings. 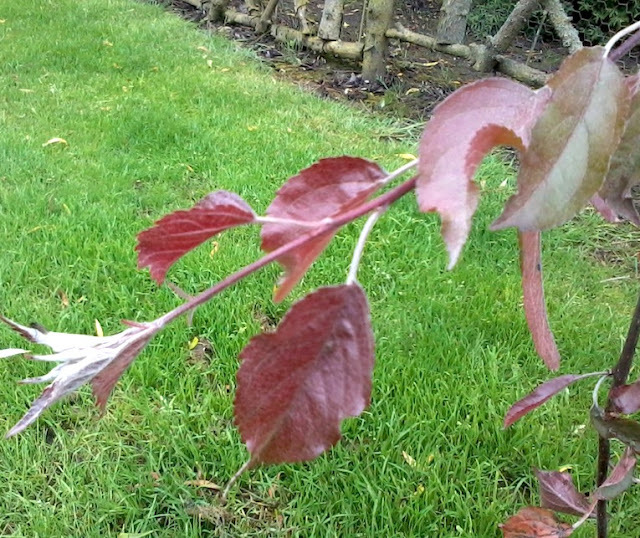 A few had the dark green leaves of its parent Malus aldenhamensis and he gave some away. He kept one that looked a little bit different and which after a few years clearly showed a pendulous habit. It would be years before it produced its magnificent crimson flowers. 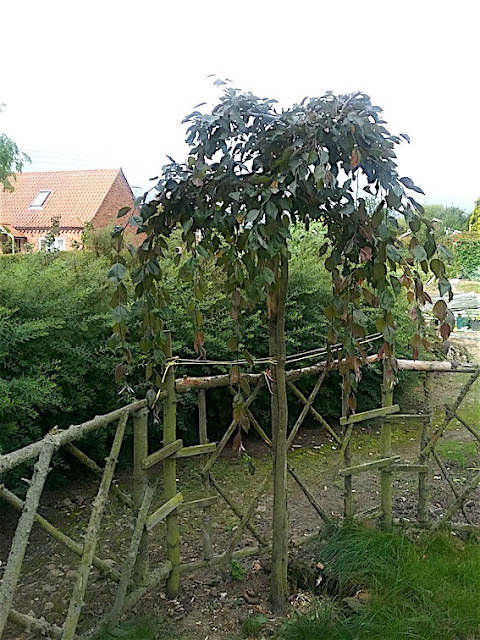 Of course anyone buying a grafted plant from Hilliers will have a flowering plant next year! 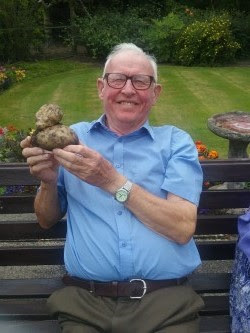 In 2014 Alan sent Hilliers a photograph. They were on the line straight away and were up in York the very next day. Alan’s weeping apple is sensational. It fills a gap in a gardener’s repertoire. There is no other weeping apple that shares its neat compact elegant nature and its fantastic dark crimson flowers. It is destined for greatness. Hillier have no doubt raised nye on a thousand. In a decade I suspect that around the world there might be nearer a million. 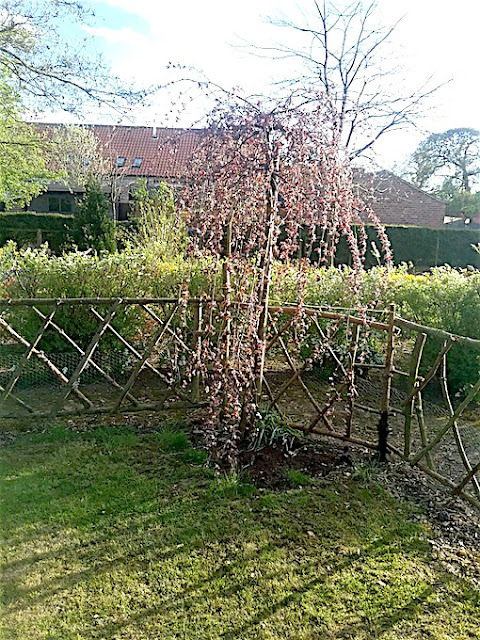 It is a dead ringer for its magnificent parent Malus aldenhamensis - except for its superb pendulous and compact habit. It makes no more than fifteen foot high. 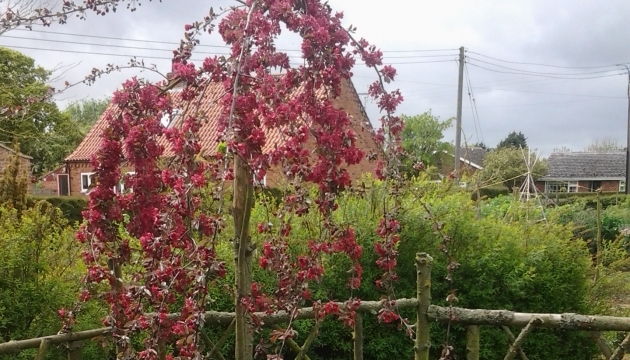 The dense flowers are a vibrant crimson, the foliage is a fetching reddy bronze and its small long lasting dark red autumn crab apples feed the birds. 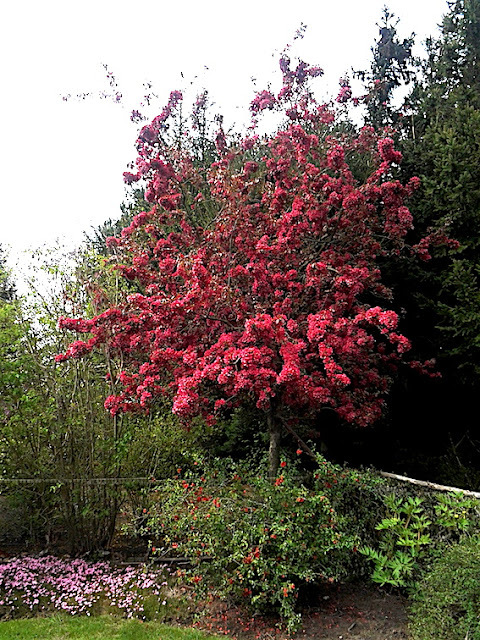 Its mother, Malus aldenhamensis is described as ‘spreading’. ‘Crimson Cascade’ is much better and actually weeps. Quite strongly, but fortunately not so tightly as to make a tight dome sweeping the ground. It is the perfect weeper not too spreading not too dense. Like it’s parent Crimson Cascade has a strong constitution and unlike similar weepers such as peach and cherry it harbours only minor pest or disease. 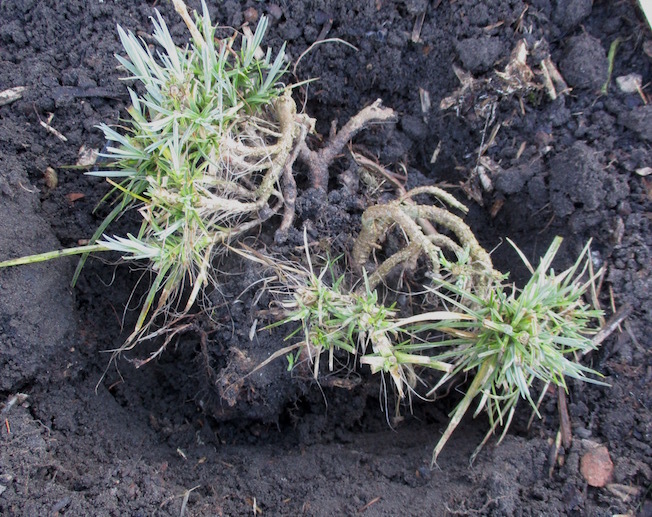 It is bone hardy and has twice experienced minus twenty centigrade for prolonged periods and not turned a hair. Alan tells me his tree has been flooded twice yet still thrives! Alan wanted to call it ‘Jean Warwick’ as a tribute his late wife. The ‘suits’ said “no, that won’t sell”. (This tree would sell if you called it a pig in a poke). They came up with ‘Crimson Cascade’ a very fine name. Pity there is a weeping peach with the identical moniker! I had the same experience when helping Yorkshire author Joyce Fussy when she registered her wonderful white dicentra which was similarly launched at Chelsea - thirty years ago. I wanted to call it ‘Joyce Fussey’. Instead it was to be ‘Avalanche’. What a very fine name. On its launch at Chelsea it had turned up as ‘Snowflakes’. I am sure you can guess why. Some of the best plants I know are named after real people. I don’t agree with the nurserymen especially when a name has an evocative story. The nerds among you will have noticed the x in the ‘latin name’ indicates hybrid origin - x purpurea means the malus species is a hybrid. In this case not a recent hybrid, ‘Crimson Cascade’ is from a self pollinated flower. It’s mother Malus aldenhamensis itself was a chance seedling found in a garden in Aldenham many years ago. It would be now speculation to discern whether that was the original hybrid cross. Another hybrid, one that occurred at Hilliers by natural and random insect cross pollination. Ten years observation at Hilliers show it to have strong hybrid vigour and to flower for much of the year. I suspect that it’s parents are Corydalis elata and Corydalis flexuosa. I don’t actually know this but I grow the variety ‘Spinners’ which has the same parents and in my garden has had flowers March through to December. (With short rests in-between). 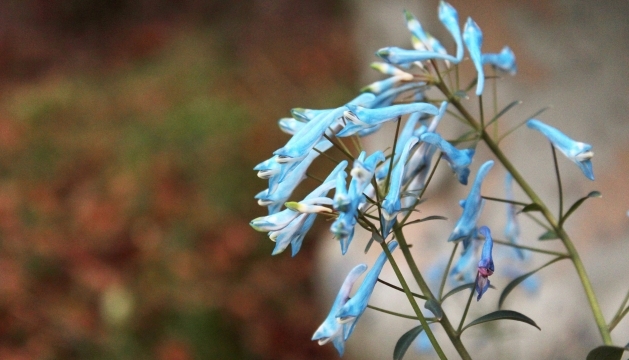 The beautiful porcelain blue in Hilliers' new variety looks the same as that in Corydalis ‘Blue Summit’. I have soft spot for Corydalis flexuosa and elata and two years ago blogged about their cultivation. Recognition at last! (The plant I mean). I have grown this delightful dwarf lily for years - and sometimes lost it too. 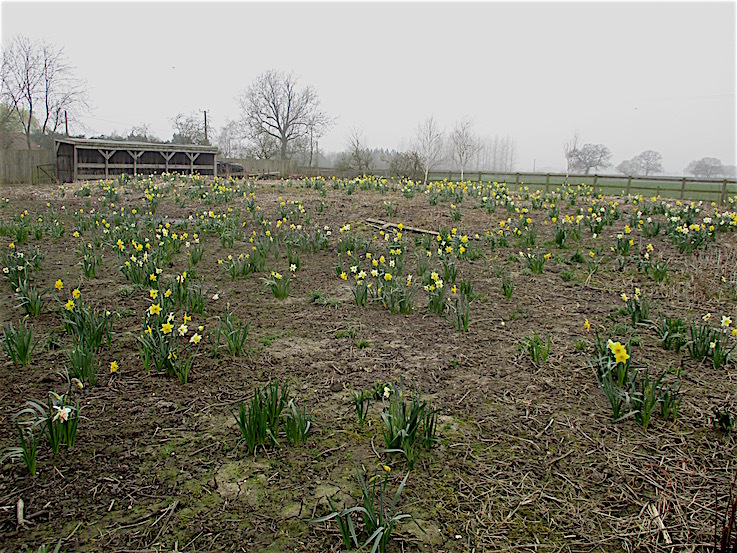 If you save its prolific seed you will have dozens of full size replacements 15 months from sowing. 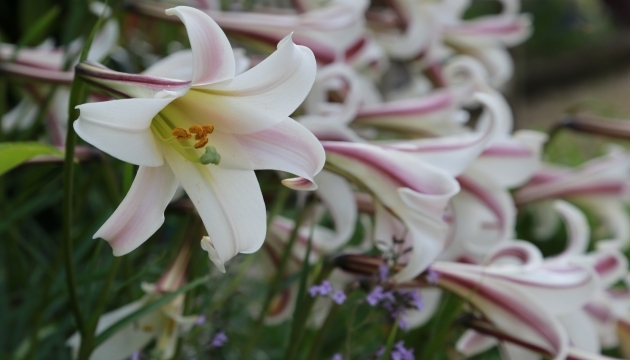 Just imagine a lily a couple of inches high holding full size white lily flowers aloft up to four inches! Some think it strange but I find it delightful and it is one of my favourite plants. I think my own Lilum formosanum pricei is an extremely dwarf form and the size I quote might mislead you. 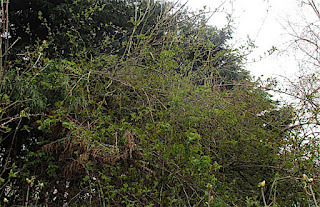 In common with most available plants of this species Hilliers’ plants grow about 15 - 18 inches high. They are hoping to achieve their seventy second gold medal at Chelsea this year and have exhibited there for more than a hundred and fifty years. I have fond memories of regularly thumbing through their catalogue which was our bible at the Lancashire College of Horticulture fifty years ago. 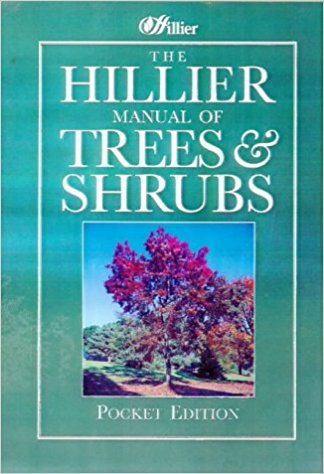 If a Lancashire gardener needed us to identify or obtain a tree or shrub it was always from Hilliers Manual. 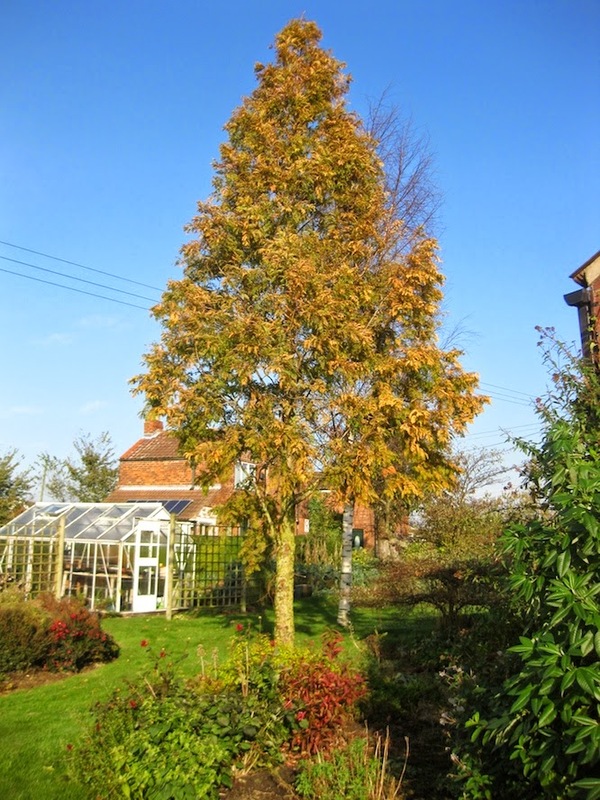 It was a complete list of trees and shrubs available from Hilliers and embraced just about every woody plant grown in the UK. Many botanic gardens were stocked from Hilliers as were many other gardens owned by the great and the good. The 72 acre Harold Hillier Garden at Romsey was donated to the public and is a must for any gardener visiting the Winchester area. The Hillier catalogue eventually appeared as a book and is still very well worth buying. Alan is 87 now and is looking good for a hundred. 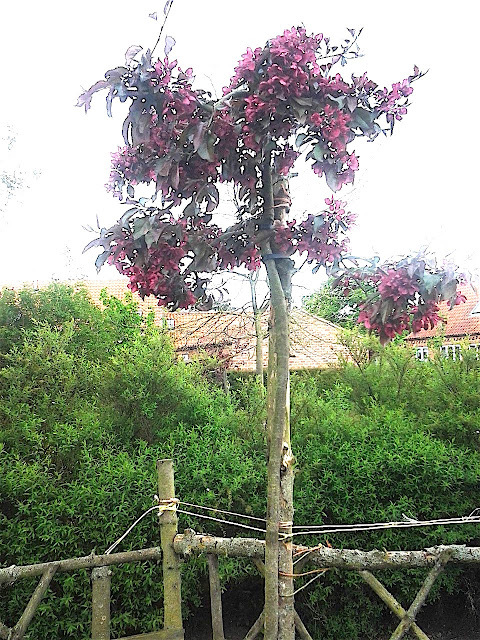 He is delighted to know that his tree will be his legacy to the gardening world. As to his theory of water movement up a tree he recognises the world is not yet ready to believe him. I suspect as a scientist recognition of the latter would give him as great a satisfaction. They have invited him down to Chelsea. He will be there on Thursday. In my opinion he ought to be there with the celebrities on Monday. Alan’s own tree burst into Spring growth ten days ago. It has the good sense to come into flower at Chelsea time! I have been carried away with new pictures from Alan and have posted again! The village event on the above date is the occasion when about half a dozen village gardens will be open. I am using this notice to also publicise the opening arrangements for myself and Peter Williams at Weathervane House for the whole of the year. We both have been deemed up to standard to open on the 7th May. Peter of course has been a constant inspiration to this blog! You may need to get in your car to come the half mile out of the village. Boundary Cottage is a ¾ acre plants man’s garden which includes twin ponds, gravel borders, cactus and succulent plants, herbaceous borders, boggy planting, a rock garden and fruit and vegetables. This garden holds the National Dicentra collection and Roger Brook writes a blog about his garden as nodiggardener. 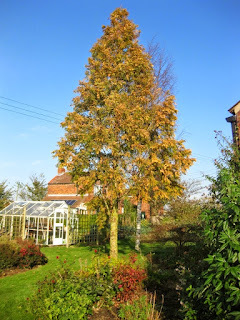 Next door is Whixley Lodge - a garden beginning to be restored, visitors are welcome to take a stroll around and to meet the pet Rheas - Phleas and Spike. 1The parish plot is owned by the Parish Council for the use of villagers and it has gradually been reclaimed from wild since 2005. Overgrown with ground elder it was treated with weed killer several times and garden plants introduced over the years. It is now a wild garden maintained on the same no-dig principle as Boundary Cottage. Once the site of charitable homes for old age village residents, the old fruit trees remain but only foundations of the houses. 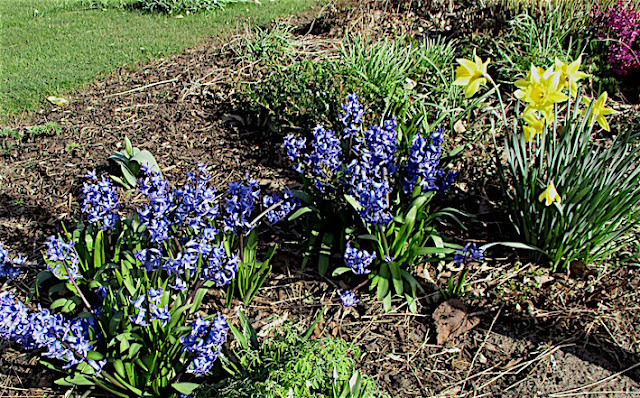 This pretty, individual garden demonstrates the gardeners like for quirky features. Irregular shaped beds, wall mirrors and interesting objects nestle among the plants and enhance the flowers. Small is Beautiful! This tiny garden bursts with life and healthy produce each year. Lean over the wall to see what’s growing; in pots, bags and hangers are five sorts of fruit, eight sorts of vegetables, blooms and produce. It just goes to show what a lot can be done with a small plot. This garden has been planted with lower maintenance in mind. 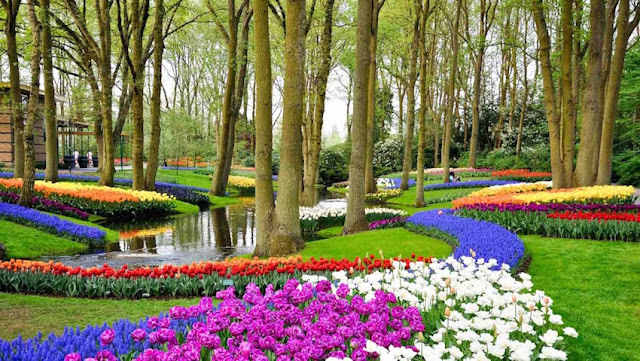 There are shrubs such as rhododendrons and roses under planted with spring and summer bulbs and some herbaceous foliage plants such as Hostas and ferns. Part of the garden is heavily shaded by the Norway Maple and Beech trees in the churchyard so trial and error dictates the plants which succeed in the shady areas. There are paths behind the beds to invite a walk around and among the garden rather than just to look out on to it. The Parish Council is in the process of buying the decommissioned, red Telephone Box outside the Village Hall. The village is thinking about how best to use and enjoy their new asset. Can you help? There is a suggestion box is inside the Telephone Box and all ideas and input are welcomed. The Telephone Box is decorated with handmade flowers and blooms in keeping with the Gardens Open Day theme. Throughout the village is a fun Flower Pot Character Trail. St Edmund’s Church is open and welcomes visitors. There are flower arrangements to enjoy. Also the Young Farmers Tractor Rally is this weekend and may pass through the village. If I might add that Cathi my blogmeister has been dragooned into opening and denies any responsibility. Regular readers will know that I personally maintain her garden which is next door to me. Cathi’s grass verge outside the garden alongside the road has been a major blog project and is always on view! The arboretum has an excellent Open Garden Scheme where twenty-seven fine gardens, many not always otherwise open can be seen. An all in ticket costs a mere £25 pounds. The best bargain you will find anywhere. If you want to attend just one garden it will cost you £5. Peter and myself have a private arrangement for our own two open days whose dates coincide. 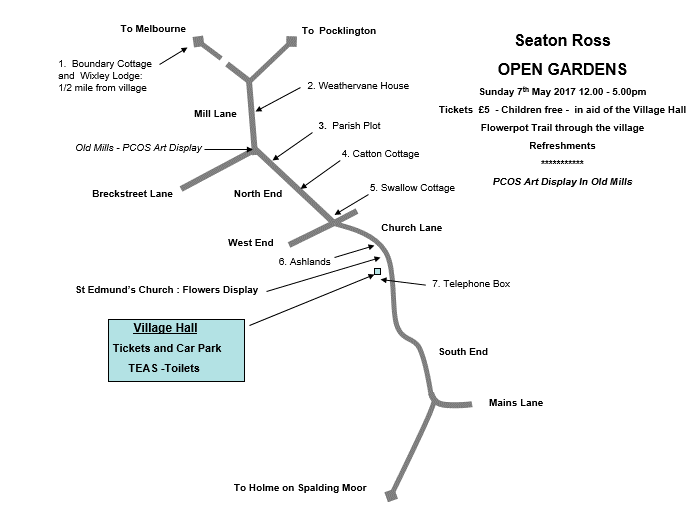 A £5 ticket will admit you to both our gardens. On the first occasion on Saturday 20th May 12pm to 5pm refreshments will be only at Weathervane House. On the second occasion on Tuesday 22 August 12pm to 5pm refreshments will only be served at Boundary Cottage. There have been several previous posts about Weathervane House and Boundary Cottage (use the search box). To give you a flavour try Weathervane House and A bit of a do - on the occasion of my wedding! This was about the village plot. When I told Brenda that I was yet again writing about hybridisation she wondered if I was wasting my time and that I was knocking at an open door. Surely it is accepted that hybridity is a significant source and distributer of genetic variation and a driver of evolution? 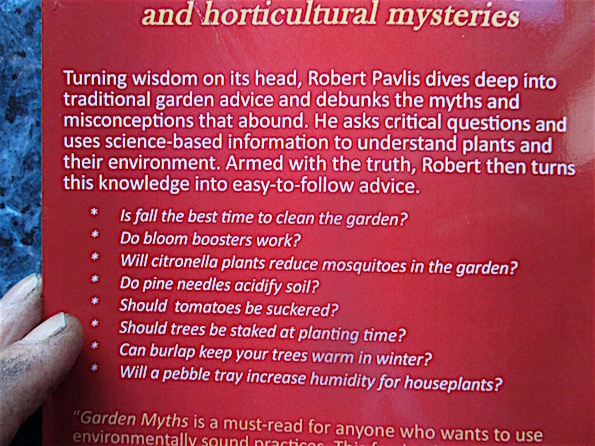 I was talking to a well informed botanist recently. He said that some botanists thought perhaps a third of all natural plant species were known hybrids. That is amazing. To demonstrate past hybridisation is extremely difficult and as you go back over millions of years genetic evidence becomes vanishingly small. Not to mention geneticists have more rewarding things to do. Perhaps all plants are derived from ancient hybrids? We just don’t have the means to know. A natural hybrid between two primula species happened at Kew more than a century ago. Initially sterile after several years a flower was able to self pollinate and set seed. It is a common plant now. Distinct new plant hybrids have a much easier time than animals to stabilise a new genome. 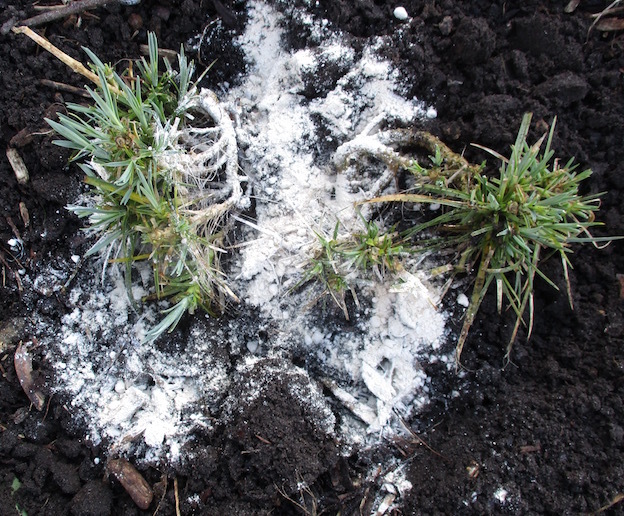 Even if they are infertile, vegetative propagation will often permit their spread and survival; plenty of time and potentially huge numbers of candidates for fertility to arise. One successful hybridisation event can produce numerous seeds and plenty of brothers and sisters. Furthermore unlike animals, plants often self pollinate and a new hybrid requires no mate. On the BBC ‘earth’ website Rebecca Ackermann of Cape Town University states that 7-10% of primates have been known to hybridise in nature. 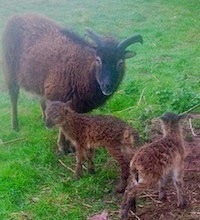 That means they have mated and brought forth viable (and often fertile) offspring. Considering their geographical distribution and how few primates overlap this is very revealing how easy hybridisation can be. You might well ask what happens to such rare animal hybrids. 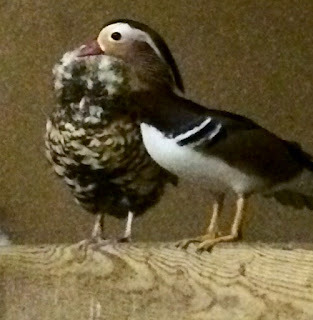 Their line only continues if they mate with one of their parent species and after a few generations their identity is lost. Never-the-less novel genetic information has moved across so called species barriers. It’s called introgression. What is really interesting is when the results of any new hybrid crosses becomes geographically isolated and inbreed within a small community leading to new species. The power of hybridisation can come from the fact that new genomes are created and genetic code comes together in exciting new combinations. More mundane - but perhaps of greater significance - is the introgression of code of advantageous small mutations - the very stuff of natural selection. There are seven billion of we humans. If a new selective advantageous variation arises on a single occasion (such as the ability to digest lactose or tolerate alcohol)) it has the potential over countless generations to be shared within the complete human race by sexual reproduction. If a new and different mutation occurs elsewhere in the population it is likewise brought into the fold. Sexual reproduction within a species is the way that nature brings together new information - and we even talk about hybridisation between different communities of any said species. Sexual reproduction across so called species barriers is essentially the same except the potential for novel combination from a much wider gene pool is hugely enhanced. Evolution has avoided a complete cross species breeding ‘free for all’ by fostering barriers between dissimilar groups.The more genetically similar two species the more likely these evolved prohibitions to successful cross breeding do not apply. The other side of the coin is that crosses between distant cousins are very rare. Never-the-less when distant crosses happen as they surely do, their significance in evolutionary terms is so much the greater. Enlightened biologists these days question the whole concept of family, genus and species. We retain the facade because it is so useful although cross-species barriers between distinct organisms often resembles a colander. The so called genetic tree of life is still a useful indicator of of life’s direction. It is not however a straight line and better than the analogy of a tree it would be better to depict it as an infinitely stranded vine constantly dividing and re-binding together. I still resent black arts such as statistical binning which clean up evidence of horizontal gene transfer every time the tree of life is amended. Despite genetic code being able to cross species barriers, life’s ability to maintain distinct species is truly amazing and insects found in amber look the same as those today after many million years. Hybridisation can be rare and crosses are ever diluted by back breeding. The fossil record shows new plant and animal species seemingly appearing from nowhere and maintaining themselves very little changed over millions of years. Significantly almost identical fossils continue from first appearance either up to extinction or up to the same organism still living today. I once read an imaginative simulation of the nearly two million years that Homo erectus existed. I could not get over the fact that in all that time change was barely perceptible from fossil evidence. As I argue today it is only from extraordinary hybridisation events that such stasis is broken and new species arise, including our own. The above text adds to my previous posts that argue for hybridity’s general significance in evolution. Today I now concentrate on the contribution of hybridisation to the human line. I draw on a recent article on the BBC ‘life’ website which adds veracity to my words as an amateur observer. Even more commanding are the links on that website to state of the art genetic investigation. 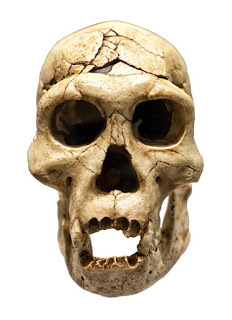 We shared the planet with neanderthals as recently as 40,000 years ago. ‘Modern neanderthal’ fossils are encountered from back 300,000 years and their emerging line much longer. Blinks of time in evolutionary terms. 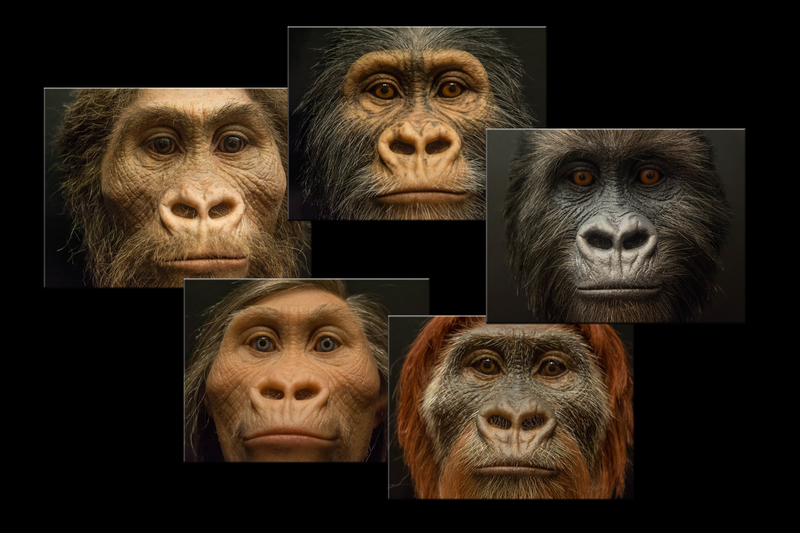 Even our earliest purported homo ancestors barely clock up ten million years. Although none of us go beyond 4% neanderthal they are not all the same genes! It would seem that if all surviving neanderthal genes were brought together we would be 20% neanderthal. 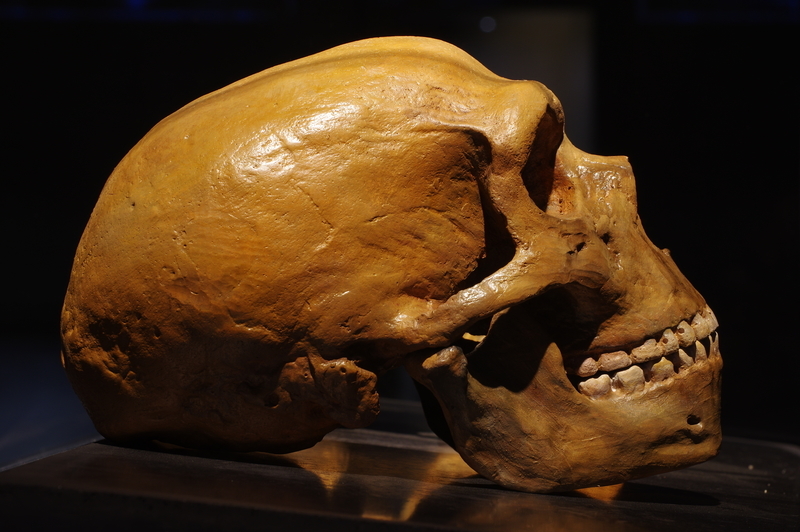 There was a fascinating find in Romania of a 40,000 year old human fossil whose skull showed clear evidence of neanderthal introgression in the jawbone. Known as the Oase individual he had perhaps 9% neanderthal genes and it would seem he was only between four and six generations beyond the actual human x neanderthal hybridisation event. Apparently none of those neanderthal genes are thought to be have passed on into our identity today. 1500 remarkable skeletons were found in the Rising Star Cave in South Africa 2013 and have been examined worldwide by hundreds of specialists. In 2015 it was named as a new homo species. Not yet accurately dated the skeletons are perhaps a million years old. It is an extreme mixture of archaic and modern human features. Variously described as mosaics or curious mixtures of ancient Austropithicene and modern homo, the word hybridisation seems to be studiously avoided. It would seem that obscure homo species occurred all over Africa and fossils are now being found all over Asia too. For example you might have read of the dwarf human species Homo floriensis now confirmed not to be a nutritional aberration! They often describe them as relic populations or evolutionary dead ends. This is true but I cannot believe they left no contribution. Fortunately more and more scientists are recognising hybridisation as a very significant part of our own evolutionary history. Many don’t choose to shout it too loudly even when they agree. 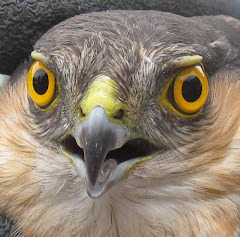 If the fate of a new fertile hybrid is to be subsumed into the parent population or survive as a new entity (probably after a few generations of breeding within one of the parent species) then in the latter case there is no time for natural selection into a new niche in the classical way. The new hybrid either lives or dies in finding a new suitable environment. Hybrids are frequently commoner in hostile new challenging conditions. Humans have evolved with outgoing generalist characteristics that have enabled us to rule the world. We have gone out into the world and exploited myriads of new niches. We are the perfect example of the power of hybridisation. I had just completed this post when Cathi celebrated my three quarter century birthday by giving me the weighty updated version of Richard Dawkins’ wonderful book ‘The Ancestors Tale’. Dawkins is my longtime hero but I have not recently read him. Although always at the forefront of genetic research and the most brilliant exponent of its translation to layman like me I feared he might not embrace modern thinking about hybridisation. I need not have worried. There would seem to be a subtle sea change in the genetic establishment’s attitude to hybridity. It’s suddenly respectable and although in my opinion the enormity of it’s significance is not yet fully reflected it moves nearer to the insights of that brave pioneer geneticist Gene McCarthy.